In 2015, Le Cordon Bleu celebrates their 120th anniversary. To mark this important occasion, le Cordon Bleu is asking students new and old, to share their memories of studying at Le Cordon Bleu. 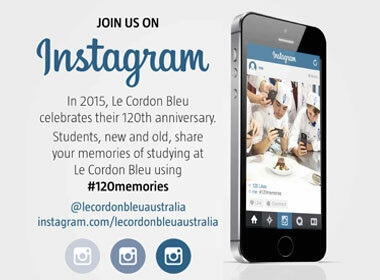 The Instagram campaign, using the hashtag #120memories wants to show images from across the 120 years the school has been running, showing student experiences and moments in history that have shaped Le Cordon Bleu. So, Le Cordon Bleu is asking all students to share their memories online, whether they are new or old, showcasing a beautiful visual history of the culture and highlights the thousands of students who study with us each year.